I want to assure all those who have e-mailed me tonight that I am doing just fine. I was not at Glasgow Airport today, but will continue to drive back and forth to both Glasgow, and Edinburgh, airports. Something all terrorist attacks have in common is a desire to frighten ordinary folks from going about their daily lives. I will certainly never given in to those kinds of threats, and fears. See you in Scotland. The first day of the Scottish Country Fair, Scone Palace, Perthshire, Scotland. Lots of trade stalls, crafts, music, exhibitions, demonstrations and displays. Scottish Country Fair Photographs. Spent part of today on a tour of Stobhall House, Perthshire, Scotland. Stobhall was originally constructed in the early 14th Century and is the historic seat of the Drummond Clan. Stobhall Photographs. Tour Scotland Ancestry Tours. 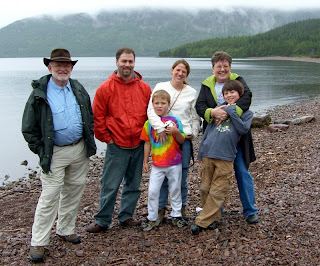 I have twelve years of experience in guiding ancestry tours of Scotland with considerable emphasis on Scottish Roots and Scottish Family History. 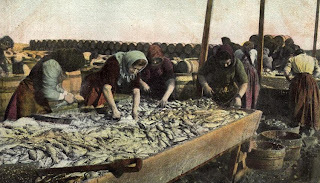 My own roots are located in the fishing villages of the East Neuk of Fife, and I am very proud to be a Fifer. Ancestry Tours of Scotland. Tour Perth, Scotland. Perth is a busy town located on the River Tay. The history of Perth dates back to Roman times, and nearby is the ancient capital of Scone, and Scone Palace. Within Perth are sites such as the Kirk of St John's, where John Knox preached, and Balhousie Castle, home of the Black Watch Museum. 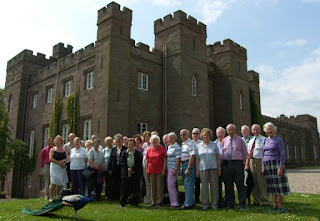 Tour Perth on an Ancestry Tour of Scotland. Just completed another small group tour of Scotland. My guests, from Western America, had a wonderful time, despite the poor weather conditions that prevailed during most of their tour of Scotland. Small Group Tour of Scotland Photographs. At last, a beautiful day here in Scotland. Toured Central Scotland. Above is a view from the ramparts of Stirling Castle, Scotland. In the distance is the Wallace Monument and the Ochil Hills. Stirling Castle Photographs. A much nicer day in Scotland. The Perthshire Stone Circle, Croft Moraig, between Kenmore and Aberfeldy, Scotland. A rainy Sunday morning in Scotland. Visited Central Scotland's premier model railway exhibition held at the Dewars Centre in Perth, Scotland. Lots of quality layouts which included, Westford, Hadley Road, Wansbeck Road, The Morven Terminal, Hewisbridge, Calder Road and Almond Bridge and a brand new railway depicting Gleneagles and Auchterarder. Spent today on a tour of Loch Ness, Culloden, and Clava Cairns. A dull, and often rainy day here in Scotland, enjoyable nevertheless. The Loch Ness Monster is a cryptid, claimed to inhabit Loch Ness, near Inverness, Scotland. Watch this wee video carefully, and see if you can spot Nessie, the Loch Ness Monster. Culloden Moor is the site of the last battle fought on Scottish soil, Bonnie Prince Charlie defeated by Duke of Cumberland in 1746. Battlefield restored to 1746 appearance. 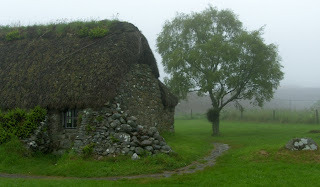 Visitor centre has audiovisual display of battle and the Old Leanach Cottage. The Battle of Culloden. The Clava Cairns, located near Inverness, Scotland, is one of the best preserved Bronze Age burial sites in Scotland. Clava Cairns Photographs. 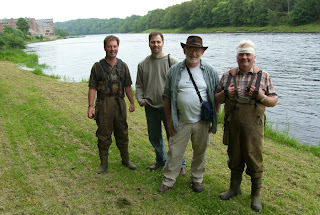 Started todays tour of Scotland with a visit to the River Tay to meet two Scottish Ghillies who were kind enough to tell us about their work as full-time Scottish Salmon Fishermen. Salmon Fishing Scotland. When driving on the narrow roads of Scotland, drive slowly, and keep your eyes open for Scottish Shepherds working their sheepdogs in the nearby fields. Came across this shepherd in Highland Perthshire. Late on in the day there were some very heavy rain showers throughout Scotland. Rain, of course, is not all bad, as it fills Scottish Rivers, and provides opportunities to get creative with your digital camera. 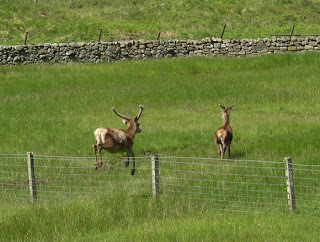 Spotted some deer in Glenlyon, Scotland, today. Tour Glenlyon. This Scottish castle stands on a green promontory between the two small streams, known as the Burn of Sorrow and the Burn of Care. Castle of Gloom Photographs. 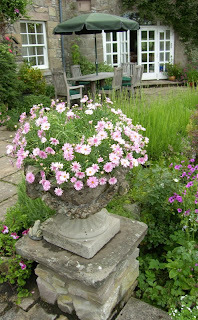 Bradystone House is just one of the many Scottish Gardens you may tour on Scotland's Gardens Scheme. Bradystone House Photographs. The Drummond Castle Gardens, Perthshire, Scotland, provide a surprise for anyone touring Scotland, they are often described as one of Europe's finest formal gardens. 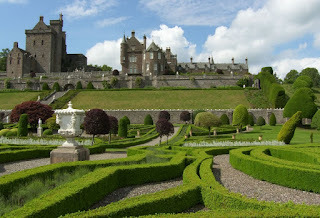 Drummond Castle Photographs. Built in 1758, and much restored, Ossian's Hall is a circular building, a folly, with an opening onto a balcony that sits on top of a rocky outcrop which overlooks the Black Linn Fall, a waterfall of the River Braan, near Dunkeld, Perthshire, Scotland. Ossian Hall Photographs. Rosslyn Chapel, Scotland. Rosslyn Chapel, or the Collegiate Chapel of St Matthew as it was to have been, was founded in 1446 by Sir William St Clair, third and last St Clair Prince of Orkney. It is in fact only part of the choir of what was intended to be a larger cruciform building with a tower at its center. 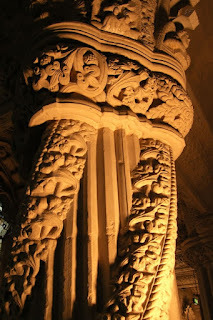 Rosslyn Chapel Photographs. Dan Brown’s intriguing novel The Da Vinci Code has proved a must-read thriller, which has captivated millions around the globe. Now made into a Hollywood blockbuster starring Tom Hanks, the controversial tale is based around a complex code hidden in the art-works of Leonardo da Vinci. The Da Vinci Code Tour Of Scotland. Interest in the Rosslyn Chapel, featured in the Da Vinci Code, has reached extraordinary proportions, with hundreds of thousands of visitors a year. This book is responding to that interest by offering the most authentic account of the building of the chapel yet published. John Ritchie, a journalist who was born in the village and whose family has been bound up with the chapel for generations, has teamed up with successful author Alan Butler to produce this definitive account. For the first time, they introduce Sir Gilbert Haye, a 15th century genius and precursor of the Renaissance, Keeper of the Royal Library in France, and family tutor to the Earl, William Sinclair, who built the chapel. They tell the truth about the chapel's relationship with the creation of speculative freemasonry, and the link between this and a very important pan European philosophy, a philosophy which promulgated a form of biblical Christianity, which had always rejected the strangling false dogma of the established Catholic Church. They explain the meanings behind the chapel's fantastic carvings, such as those showing corn cobs which would have been carved two centuries before Europeans apparently visited the Americas and found the plant. The pillar which for 200 years has had its story hidden, until now. It is a journey through a secret library of stone, to the very essence of history itself. Importantly, Butler and Ritchie show that the truth about the chapel is stranger than fiction, and allow the chapel itself, to tell it own story through its carvings. Rosslyn Revealed: A Library in Stone . 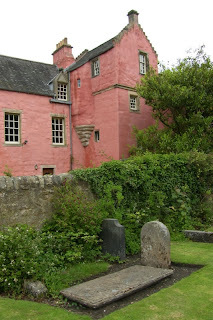 The Abbot House in Marygate, Dunfermline, Fife, Scotland, is the oldest house in Dunfermline, and is now a Heritage Center well worth visiting on any tour of Scotland. Abbot House Photographs. Interior of the old Abbey Church, Dunfermline, Fife, Scotland. Dunfermline was renowned as the burial place of many Scottish Kings and Queens. The first was Queen Margaret, later Saint Margaret, in 1093, and the last Royal internment was Robert, the infant son of James VI and Anne of Denmark, in 1602. The most famous burial, and certainly most celebrated, was Robert the Bruce who was buried in Dunfermline Abbey. The interior of Saint Fergus Kirk Glamis, Angus, Scotland. The present church was built 1792 on the site of church dedicated to St Fergus 1242. Glamis Castle. Only one period in history is immediately, indelibly and uniquely linked to the whole area of the Scottish and English Border country, and that is the time of the Reivers. Whenever anyone mentions 'Reiver', no-one hesitates to add 'Border'. It is an inextricable association, and rightly so. Nowhere else in Britain in the modern era, or indeed in Europe, did civil order break down over such a wide area, or for such a long time. For more than a century, the hoof-beats of countless raiding parties drummed over the border. From Dumfriesshire to the high wastes of East Cumbria, from Roxburghshire to Redesdale, from the lonely valley of Liddesdale to the fortress city of Carlisle, swords and spears spoke while the law remained silent. Fierce family loyalty counted for everything while the rules of nationality counted for nothing. The whole range of the Cheviot Hills, its watershed ridges and the river valleys which flowed out of them became the landscape of larceny while Maxwells, Grahams, Fenwicks, Carletons, Armstrongs and Elliots rode hard and often for plunder. These were the Riding Times and in modern European history, they have no parallel. This book tells the remarkable story of the Reivers and how they made the Borders. 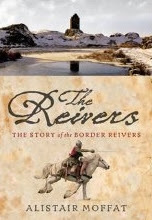 The Reivers: The Story of the Border Reivers . Tour Scotland, South Queensferry. I normally visit this village on all my tours of Scotland. South Queensferry is located on the shore of the Firth of Forth between the Forth Bridge and the Forth Road Bridge, just eight miles from Edinburgh Airport. The original Hawes Inn in South Queensferry features in Robert Louis Stevenson's book Kidnapped. Birnam and its larger sister town Dunkeld sit on opposite banks of the fast flowing waters of the River Tay in Perthshire, Scotland. Linking the two towns is Thomas Telford's stone bridge. On one of her regular holidays to Birnam, Beatrix Potter wrote the famous letter which was to be published worldwide as "The Tale Of Peter Rabbit". In Birnam's Beatrix Potter Garden, you'll meet many of her favourite characters. Birnam is a village which was much developed in Victorian times, as may be seen by the buildings from that time period. Uig, in the stunning Trotternish Peninsula, Isle Of Skye, Scotland. Uig Video. "I am sure this golf ball was lost Dad, for I saw some men looking for it." 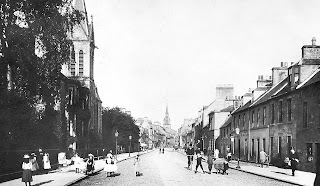 Newport-on-Tay in North Fife, Scotland, was previously named New Dundee and was regarded as a fashionable place to reside by the wealthy Jute Barons of Dundee in the 19th century. Consequently this led to the village of Wormit being established as a commuter town and rail link between Newport-on-Tay and Dundee. Wormit also claims its place in history as the first village in Scotland to be powered by electricity. Today Newport-on-Tay and Tayport are ideal places to use as a base to explore North East Fife and Dundee area. Are your Scottish Roots From Newport ? The town of Cupar, in the Kingdom of Fife, is one of the oldest burghs in Scotland and although the earliest known charter dates back to 1382, it was a prominent burgh long before then. Cupar has always benefited from its central location in the Howe of Fife as the converging roads from Falkland, St. Andrews, Dundee and Edinburgh made Cupar the natural place for the Thanes of Fife to build their castles over one thousand years ago. Records date back to 1239 confirming Cupar as the Seat of Justice and the early Sheriff Courts were held on the Moat Hill. The old Parish Church in the Kirkgate was originally built in 1415 and only the tower and spire retained when it was rebuilt in 1785. In the Parish cemetery lie the heads of two Covenenters and a hand of the infamous Hackston of Rathillet. In 1679 when the Archbishop James Sharp was dragged from his coach on Magus Muir and murdered by the Covenanters, Hackston of Rathillet sat impassively on his horse watching the gory proceedings. For his involvement in this murder he was cruelly executed in Edinburgh in 1680. Are your Scottish Roots in Cupar ? A Dictionary Of The Scottish Language. Ancient Gaelic Poetry. An Orkney Wedding. Letters from the Highlands. History of Glasgow, Paisley, Greenock and Port-Glasgow. Annals of the Parish. The Fairy Mythology. The Highlanders of Scotland. Jacobite Memoirs of the Rebellion of 1745. Biographical Sketch of the Late Robert Stevenson. A Voyage to the Hebrides. Memoirs of the Life of the Right Honourable Sir James Mackintosh. History of the Western Highlands and Isles of Scotland. The History of Scotland. Tales and Sketches. Glasgow and Its Clubs. Memoirs of the life of Sir Walter Scott. The Waverly Anecdotes. Popular Tales of the West Highlands. Stories from the history of Scotland. Lays Of The Scottish Cavaliers. My Schools and Schoolmasters. Memoirs of Prince Charles Stuart. Chronicle of Scottish Poetry: From the Thirteenth Century to the Union of the Crowns. The Book of the Thanes of Cawdor. The Life of Thomas Muir. The Works of Adam Smith. The Life and Character of John Paul Jones. Read These Free Scottish Books. My daughter Mharie driving over Dunkeld Bridge, Scotland. This recent small group Tour of Scotland included, Edzell Castle, Castle Campbell, Glamis Castle, Carnoustie Golf, Croft Moraig, Cuillins of Skye, Donnattar Castle, Dunfermline Abbey, Dupplin Cross, Elgol Skye, Falkland, Glen Quaich, Glencoe, Kyleakin, Kyle of Localsh, Loch Leven Castle, Loch Tay, Plockton, Portree, St Andrews Old Course, Anstruther, Armadale, Pitlochry, Kilmuir Museum Skye, Kirriemuir, Dunkeld Cathedral, Stirling Castle and much more. May June Tour of Scotland Photographs. Colchester Caledonian Society coach tour of Scotland. 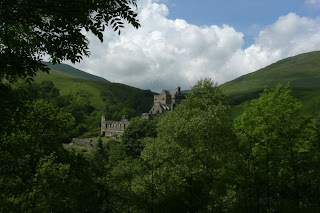 Included; Scone Palace, Dunfermline Abbey, West Highland Line, Loch Katrine, Glamis Castle. 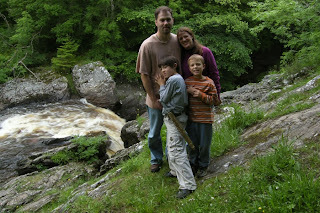 The Hermitage is a National Trust for Scotland site in Dunkeld, Perthshire, Scotland. 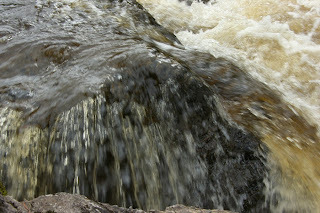 Located just to the west of the A9, it sits on the banks of the River Braan. Queen Victoria visited Rumbling Bridge near Dunkeld, Perthshire, Scotland, in 1865 and was much impressed by the dramatic watery scene. In her diary she wrote that the flow was most splendid and that swollen by rain, it came down with an immense volume of water, with a deafening noise. The John Knox House is an historic house in Edinburgh, Scotland, reputed to have been owned and lived in by Protestant Reformer John Knox during the 16th century. The house itself was built in 1490, featuring a fine wooden gallery and hand-painted ceiling. Over the next few centuries many decorations and paintings were added, and the house and its contents are now a museum. The building is owned by the Church of Scotland and is now administered as part of the new, adjacent Scottish Storytelling Centre. Tour Leven on a small group tour of Scotland. Leven burgh consists chiefly of 3 streets running parallel to each other, east and west, and connected by a number of bye-lanes. It is connected to Innerleven by a fine stone bridge. As with other towns on this shore, it is a favourite resort in the summer for sea bathing. A number of inhabitants are engaged in hand-loom weaving, but the greater number are employed in the mills in this and the neighbouring parishes. There are flax spinning mills, saw mills, a flour mill, a bone mill, a lintseed oil mill, a herring net factory, an iron foundry and a brickworks. There is a parish church, a Free Church and a UP Church. There was formerly an independent chapel, but it has been shut for some time. edited from Westwood's Directory for the counties of Fife & Kinross published 1862. Tour Kinglassie on a small group tour of Scotland. The parish of Kinglassie extends 4 miles length, by 2 in breadth at its narrowest part and 4 at its broadest. It is watered by the Lochty and the Ore, tributary streams of the Leven. On the first of these stands the irregular village of Kinglassie, which is 2 miles from Leslie, and 3.5 north-east from Lochgelly. There are quarries of freestone, and the coal obtained in this parish is considered the best in the county. The inhabitants of the village are principally supported by weaving. The places of worship are an established and a free church. A fair is entitled to be held on the third Wednesday in May. from Slater's Directory, published 1852. "Well, Sandy, have you watered down the milk, put sand in the sugar, and mixed all the dead flies in the currant buns ?" "Good, we'll make a Scotsman of you yet." Dunfermline Abbey was a large Benedictine abbey in Dunfermline, Fife, Scotland. It was administered by the Abbot of Dunfermline. The abbey was founded in 1128 by King David I of Scotland, but the monastic establishment was based on an earlier foundation dating back to the reign of King Malcolm Canmore.